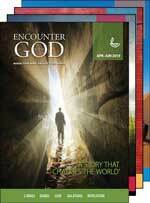 A subscription to Encounter With God will ensure that you receive four editions of the booklet over the year, for free delivery within Australia. Encounter with God is Scripture Union's daily Bible reading guide designed to lead you to a deeper understanding of what God is saying to you and to His world today. You will find its thorough and energetic investigation of the whole Bible inspiring and stimulating. And you'll discover that its biblical exposition is complemented by pastoral warmth from a strong field of writers and contributors. As well as daily content, feature articles provide insights into Christian spirituality, tackle contemporary issues, and profile teachers who inspire. There are Bible in a Year readings at the foot of the page for those who want this additional option.